Exercising on a hard surface increases the strain on joints and muscles, which is why a comfortable surface is so key to a successful workout routine. With a depth of 1.5cm, the Core Balance NBR Foam Mat is almost double the thickness of a standard mat for enhanced comfort whilst working out. 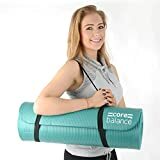 The extra-thick surface is designed to lower fatigue and reduce the risk of injury, enabling you to exercise for even longer The mat also has a textured non-slip surface for greater grip, support and stability whilst stretching. They’re a great choice for exercise, Pilates and yoga. Features: Extra-thick 1.5cm NBR foam. Textured grip for stability whilst stretching. Non-slip, lightweight and quick-drying. Shoulder carry strap included. Size (cm): L183 x W60 x D1.5.